FIRST THINGS FIRST: Make Lists! Have a packing list for each family member, even pets if you’re bringing them along! You can even make packing lists for the kids into a scavenger hunt game for the young ones! This teaches kids to pack their own luggage early on, which can be very helpful if your family travels a lot. You can even laminate these lists to reuse a the end of your trip! Speaking of packing: Pack Light! If you plan on bringing any souvenirs home, you’ll thank yourself later for that extra room you left in your luggage. With long road trips, you’re bound to accumulate trash. Use the bags to keep the car clean along the way, or for wet clothes, or for worse: car sickness. Don’t forget a First Aid Kit! No explanation is needed here. Driving longer than 24 hours? 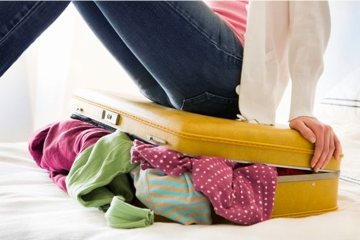 Pack a separate, smaller suitcase with the whole families essentials for that one, mid-trip over night. This way you can save time by avoiding everyone re-packing their luggage. Also, bring familiar blankets and pillows to mask the strange hotel smells. This can also help encourage drive-time naps along the way! Decide beforehand on rotating systems for anything that might cause a fight during the time on the road. If you decide to bring devices, make a visible time sheet of when those devices can be used and by whom. This can help avoid any bickering later on, as well as leave room for no-screen activities like “I Spy”, or 20 Questions. This helps with fewer stops during the trip, and if you pack healthy snack like fruits and veggies, you can avoid junk food along the way. Plus, this is an easy way to stay healthy with the lack of physical activity during the car ride. Have EVERYONE use the potty before you hit the road. That way you avoid making an early stop. Also limit the liquids brought in the car, that way you can better plan out your pit stops. Some great road trip apps include: GasBuddy, TollSmart, iExit, RoadTrippers, Spotify, Urgent.ly, and of course goBaby! Always remember, life is an adventure. Take the bad with the good, and don’t let things stress you out. Just have fun! 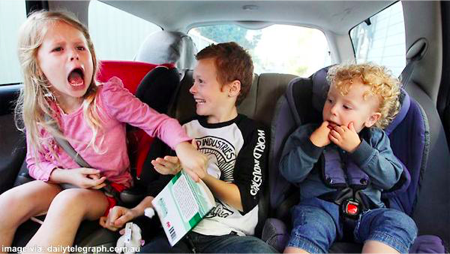 With these tips you’ll be sure to have the best family road trip!